This applique quilt is based on a Persian ornamental design from a Dover book. While I was working on it, our cat, Miss Kitty, insisted on helping with every step of the process, and that is how the quilt got its name. It is done completely by hand, using the hand needle-turn method for applique. It's also hand quilted, but the applique is so intense, the quilting doesn't even show. It measures 40" x 28", and some of the fabrics are fabrics I dyed myself. It took 211 hours to make. 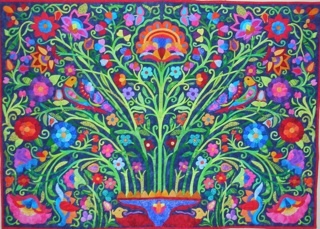 This quilt has won numerous awards in local, regional, and national competitions, and was published in the book "500 Art Quilts", by Lark Books in spring of 2010. A selection of quilts from the book hung at the IQA Festival in Houston in Fall 2010, and my quilt was invited to be one of them. If you're looking for a cute quilted Christmas stocking...do click on her "What's New" tab...she's got two fabulous 'cowboy boot' Christmas stocking patterns available! Just use the comment link below!